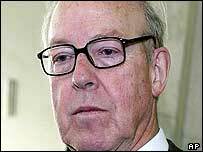 Hans Blix, a mild-mannered, veteran diplomat has made a career out of keeping his cool. This was probably one of the reasons why UN Secretary General Kofi Annan plucked the Swede out of retirement in 2000 to offer him the difficult job of head of the UN Monitoring, Verification and Inspection Commission (Unmovic). But his cautious approach would also appear to have translated into a devastating criticism of the decision by the US and UK to go to war, less than a year after the US-led invasion and the overthrow of Saddam Hussein. Mr Blix is well-used to feeling the heat over Iraq. As director general of the International Atomic Energy Agency (IAEA) from 1981 to 1997, he was in charge of overseeing inspections of the country's nuclear programme. 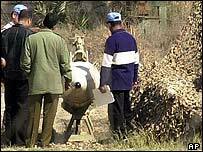 During that time, the Iraqis managed to hide an advanced nuclear weapons development programme from the IAEA. It was only discovered after the Gulf War in 1991. Last year, the Washington Post reported that the Pentagon had ordered a CIA investigation into how the IAEA could have erred. Mr Blix says the experience taught him something. "It's correct to say that the IAEA was fooled by the Iraqis," he said recently. But, in a report to the Security Council last year, Mr Blix calmly put Baghdad on notice that he would not allow himself to be duped once again by the regime. Dr Blix was a compromise choice for the role of overseeing the latest, abortive, weapons inspections. The Security Council had rejected Rolf Ekeus, the candidate put forward by the United States and Britain. Washington hawks initially opposed the appointment, with critics arguing that he was overly concerned with Iraqi sensibilities and not the man for a showdown with Saddam Hussein. They pointed to the "cultural sensitivity" training members of his organisation undergo. They saw it as a sign that Mr Blix and his staff worry too much about hurting Iraqi feelings, and are therefore liable to be duped. But the Unmovic leader said the training programme was designed simply to prevent members of his team from appearing aggressive - a label that clung to previous weapons inspectors. Iraq repeatedly clashed with previous UN envoys, but Mr Blix avoided this. He brought his famous qualities of calm to bear when confronting Baghdad and conveying the message that it must do something to demonstrate it is telling the truth about its weapons programmes or face war. Mr Blix appeared to walk a middle ground during the Iraq crisis. Initially he was keen to show his independence from Washington, even refusing to hide his frustration with the Bush administration over key intelligence he wanted it to share. Now that the war has finished, he has made clear his feeling that the US and UK had exaggerated, or "over-interpreted" - as he put it - the case for war. He expressed his doubts about the UK Government's famous statement that Saddam Hussein could deploy chemical and biological weapons within 45 minutes. He has also spoken of the impression of a culture of spin and hype surrounding George W Bush and Tony Blair. He famously compared their governments' attempts to make the case for war with an advertiser trying to sell a fridge. Mr Blix has fine credentials. He has a doctorate in law, and has pursued his studies in Sweden, England and the US. He joined Sweden's foreign ministry in 1963, and became its head 15 years later. He spent 20 years on Sweden's delegation to the Conference on Disarmament in Geneva before heading the IAEA. Mr Blix has written several books concerning international and constitutional law.